Now is the time to start planning your travel within Sweden and Denmark which is blessed with some of the highest powered sights. Sweden is a long country, the south is close to the continental climate and the very north offers a wild mountainous landscape. The best variety of agriculture is offered from their capital Stockholm and south. On a tour in Sweden you will see the typical landscape; forest, open land and water. You will meet representatives from traditional livestock and grain farming, forestry, bioenergy, small scale food production and tourism. Depart North America for Stockholm, Sweden. Stockholm is generally referred to as Beauty on Water, or Venice of the North, which is understandable, as the city is built upon 14 islands. It is surrounded by Lake Mälaren, and by the Baltic Sea. Arrive Stockholm Arlanda Airport, and transfer to central Stockholm. Check in your central hotel to refresh. Lunch on your own, walk with your guide for a slow 1 hour walk in the city center in the vibrant shopping streets and cultural “Beach Avenue” with archipelago boats and the Dramatic Theatre. Overnight and dinner at Scandic Park Hotel. Breakfast, followed by city sightseeing including Vasa Museum and the City Hall. During the tour you will walk in the old town and opportunity to have time to enjoy lunch on your own. The warship Vasa was built as a proof of the great power to impress the world but sunk on her maiden voyage leaving Stockholm in 1628. She was brought up to land 1961 and restored. Today Vasa is a worldwide sensation in her museum. Stockholm’s City hall was built between 1911- 1923. It is one of Sweden's foremost buildings in the National Romantic style. Behind the imposing facades, built with 8 million bricks are offices, meeting rooms and banqueting halls. Inspired by the palaces of the Renaissance, the architect had the City Hall built around two squares or "piazzas", Borgargården and the Blue Hall. This is where the Nobel Prize banquet takes place every year in December. 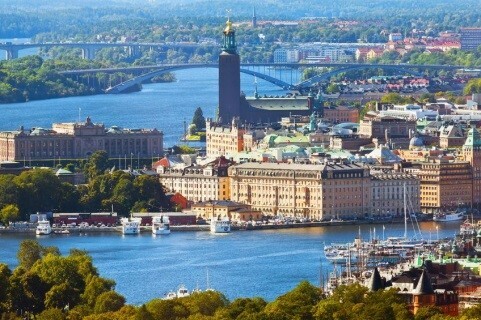 After lunch, enjoy 1 hour boat tour in Stockholm around the island of Djrugarden. Dinner including a short walk through the open air museum Skansen. Overnight at same hotel in Stockholm. Have breakfast, check out, leave your hotel and travel west. You will have a technical visit at an organic producer of vegetables, herbs and berries in their greenhouse, free land and tunnels. They have a farm shop, restaurant (lunch on the farm) and activities for groups. Location of the farm is situated by Lake Mälaren. The next visit in the afternoon is on the largest ecologic dairy farm in the Nordic countries. They have 1250 milking cows, aiming to be 100% self-producing its own energy plus they deliver Biogas to all public transport in Stockholm City. You travel to your hotel in Lidköping with dinner at hotel together with local farmers. Overnight at Best Western Edward Hotel. Early breakfast and check out. Departure from Lidköping and travel to Gothenburg (2 hours), board your ferry to Denmark. Brunch will be arranged on the ferry. You will meet your new guides and begin your tour in Denmark. Board the bus and stop in small village of Gravlev and the National Park of Rebild where Danish Americans celebrate the 4th of July Rebild Festival every year since 1912. person involved in the Danish American Club will give a small introduction at the Rebild Museum. Continue your travel to Randers, check in at the hotel which is well situated in the city center close to the pedestrian streets. The old houses (half-timber and red brick buildings) surrounding the area witness a lively trade and activity in the past. Dinner and overnight at Hotel Randers, which is well situated in the city center, more than 150 years old and has been totally renovated last year has a charming old fashioned atmosphere. After breakfast, depart to Roende. Meeting at the local farmers’ union. There are about 25 such local farmers’ unions in Denmark where farmers can provide technical advisory. Introduction to “The Danish Model”, the advisory system, political issues, EU politics and regulations (important to understand the way they produce in Denmark/ Europe). An example: Minimum fertilizer, green paddies year round, controlled spraying and no hormones. Possibility for ladies to explore the little town of Roende with many shops instead of the meeting with the farmers’ union. Lunch on your own in Roende. After lunch, visit a Ballegaard Farm with pig fattening and cereals/seed production. A family operation with father and two sons, have approx. 19000 piglets on 3 different sites, 1,000 ha of cereals and spinach seeds plus a small vineyard. Next stop will be a short visit and the combined daycare/kindergarten “The Milky Way” (children from infant to 6 years). Next visit the National Museum of Agriculture, with retrospectives about agriculture and present issues. Or, the ladies may want to visit the old manor house (the first buildings date back to 1340) with beautiful interiors from the period of the United Kingdom Denmark-Norway. End the afternoon back in Auning and enjoy a dinner buffet in a private home where Danish guests will join you. Return to same hotel Randers for overnight. After breakfast, check out and travel to the Odder/Skanderborg region. You will visit the MAANSSON Company, which produces a wide range of organic vegetables, lettuces, onions, broccoli, etc. Additionally they have an organic egg production from 141,000 egg layers in 2016. The company delivers products to the whole country. Continue to Vejle for a short visit at Lindtved dairy, a small private dairy which produces different types of traditional Danish cheese and butter. The owner is a former cheese seller who dreamt about starting his own dairy and sells his products directly to the consumer plus he also imports cheese from other European countries. You will have light lunch with bread and the local cheese. Late afternoon you arrive in Odense, the 3rd largest town in Denmark, check in at Hotel HC Anderson. Enjoy a short walk in Odense “in the footsteps of the storyteller Hans Christian Anderson” passing Andersen’s home. Dinner on your own this evening either at the hotel or in a café or restaurant within walking distance of the hotel. After breakfast at hotel, travel to the Island of Zealand passing the 2nd longest bridge in the world. In Roskilde, the former capital of the Danish kingdom, enjoy a visit at the Viking Ship Museum where you will start with a film about the newly built boat “The Sea Stallion” and the voyage made by the ship from Roskilde to Dublin where the original ship was built back in 1030’s. Visit the museum and the outdoor facilities on your own and have time enough in the very nice souvenir shop. After lunch on your own in Roskilde city centre, you will visit Roskilde Cathedral (on the UNESCO list) where all Danish kings and queens are buried. Your afternoon will end at Scandic Palace Hotel in Copenhagen with check in and time to relax and freshen up. The hotel, built in 1910 is situated in the very centre, close to the Town Hall Square. Stars including Judy Garland, Audrey Hepburn and Errol Flynn have stayed at this stylish hotel. With some time on your own, choose to visit include the Glypototek Art Museum (closes at 6 pm); the Round Tower (closes at 6pm) or the Cathedral of Copenhagen (closes at 5pm); take a canal and harbour boat tour or just enjoy a walk in the main pedestrian street, the Stroeget. Copenhagen with its 1.5 mil. inhabitants is the most cosmopolitan city in Scandinavia but at the same time it keeps its charming provincial atmosphere with small quiet streets dating back to the Middle Ages, canals and green areas. The city was founded approx. 1160 by Bishop Absalon and witnesses of a rich and tumultuous history with both dramatic events and flourishing periods favourable to art and beautiful architecture. In the evening take a five minute walk to Tivoli Gardens. Created in 1842 is one of the oldest amusement parks in the world and the 4th busiest park in Europe. Dinner is served at a restaurant inside Tivoli. Free time to enjoy the different activities (not included) at Tivoli and walk back to hotel at own choice. After breakfast and check out (8 am) there will be a guided city tour with a local Copenhagen guide. You will pass the Little Mermaid sculpture and the Gefion Fountain; the Rosenborg Castle and Gardens, the Parliament, the Former Stock Exchange, the Palace of the Danish Royal Family, and the National Library to name a few. Bid farewell to Denmark and transfer to the airport for your return flight to North America.